Canada's federal government has reintroduced copyright legislation into the House of Commons in an attempt to modernise the country's law, last updated in 1997. The former Liberal government introduced proposed legislation in 2005 and the Conservatives made two attempts during their minority governments in 2008 and 2010, but none passed. The new bill is an attempt by the Canadian Government make the Country's copyright laws fit for purpose in the digital age. Bill C-11, the Copyright Modernization Act, is an exact copy of legislation tabled by the Conservatives in 2010, Bill C-32, which died when the last Canadian Parliament was dissolved. The legislation the aims to strike a fair balance between the rights of consumers to use products they buy and those of copyright-holders who are entitled to due compensation for their creations. The law would legalize everyday consumer practices that are currently prohibited, such as using a personal video recorder to record a TV show for later viewing, or copying music from a purchased CD to an iPod. It would further allow educators, artists and satirists to break copyright under limited circumstances if the use is fair and not exploitative, and would also allow "mashups," where people transform or remix existing creative content into new works, as long as it's not for commercial purposes and doesn't have a significant adverse effect on the original rights-holders. The bill will also protect Internet intermediaries from liability for the actions of their users by providing for ‘safe harbour’ exemptions. Many Canadian commentators say that in the absence of such protections, search engines, video sites and blog hosts are vulnerable and often remove legitimate content under threat of legal action..
To some commentators a less welcome provision (and the sticking point in previous attempts to pass this bill) is the blanket ban against breaking digital locks, even for purposes of personal use. This includes "picking" a lock on a DVD purchased overseas to watch at home, or transferring a purchased protected e-book to read to another personal device. The bill provides for $5,000 fines for even the smallest such violations. 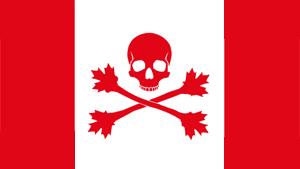 Many see the provision as the end result of heavy pressure from US authorities who had placed Canada on a copyright piracy ‘watch list’ alongside Russia and China as a ‘hotbed of piracy’, and in the interest of maintaining cross-border trade and exemption from protectionist measures that would prevent Canadian firms from bidding on U.S. government procurement contracts. Critics of the proposed legislation have said the provisions which relate to breaking a digital lock go too far and undermine the rights of users to use content for the purposes of education and fair dealing. Professor Michael Geist, Canada Research Chair in internet and e-commerce law at the University of Ottawa, called the proposed legislation “a tale of two bills.” He credits the Conservative government for attempting to strike a compromise on issues such as fair dealing and the ability to use copyrighted works for non-commercial purposes without permission to create mashups, tailoring damages under the act to create a distinction between commercial and non-commercial infringement, and addressing the role of internet providers. But, he said, the government was influenced by the United States to implement the tough digital lock provisions despite feedback from Canadians during consultations on the earlier bill saying "“[The provisions] remain unchanged and are one of the most inflexible, restrictive digital lock provisions in the world”. The bill’s passage will also allow Canada to ratify the World Intellectual Property Organization internet treaties it signed in 1997. Ben, while I appreciate that you appear to be drawing your information primarily from third party sources, I generally expect better accuracy from this blog on copyright related matters. "To some commentators a less welcome provision (and the sticking point in previous attempts to pass this bill) is the blanket ban against breaking digital locks..."
The sticking point in previous attempts to pass copyright reform has not been anti-circumvention, it has been that Canada had a minority parliament when all three previous attempts were introduced and an election was always triggered before Parliament could pass the bill. The Government got closest with C-32, but due to the overwhelming number of stakeholders demanding to be heard when the bill was referred to a special legislative committee for review, the Committee did not complete its review before the election was called. "This includes "picking" a lock on a DVD purchased overseas to watch at home, or transferring a purchased protected e-book to read to another personal device. The bill provides for $5,000 fines for even the smallest such violations." While "picking" a lock COULD POSSIBLY be prohibited (like many jurisdictions, the Bill prohibits circumvention of access controls, but does not prohibit circumvention of copy controls, so one may "pick' those locks with impunity), "$5000 fines" are not available. First, there is no criminal liability for the act of circumventing an access control, so there are no "fines" available. Furthermore, the Bill specifically limits liability for anyone who circumvents an access control "for his or her own private purposes" by barring the rights holder from electing statutory damages, thus limiting any potential damage award to actual, provable damages (which, under these circumstances, are very likely to be nominal). So the Bill effectively immunizes those circumventing for personal purposes from legal action. It's also worth noting that the Bill introduces a new, lower tier of statutory damages for "non-commercial" infringement, which is when you get the "$5000 fines" from. However, this lower tier is actually a range between $100-$5000 to be determined by the court, and anyone familiar with Canadian precedents regarding the application of statutory damages will know that any infringement for personal use will follow on the VERY LOW end of the spectrum (judges actually have discretion to award below $100). Moreover, it is very important to realize that this range is not per infringement, its for ALL infringements at issue in the proceedings, so it's a single award. Furthermore, any other rights holder is BARRED from electing statutory damages for ANY infringements the person has ever done before the proceedings were filed. So effectively this one damage award that will apply to all infringement the person has ever done in their entire life to that point. Hence why some have pointed out that this "all you can eat" model may actually incentivize infringement to maximize the value of that one, single damage award. Finally, Prof Geist's assertion that the anti-circumvention provisions "are one of the most inflexible, restrictive digital lock provisions in the world" does not hold up under any serious scrutiny. The Bill includes a long list of exceptions to anti-circumvention, including for privacy, security, interoperability, encryption research, changing wireless providers, etc., that are actually broader than those found in most jurisdictions. The Bill also grants broad regulation making power for the introduction of new exceptions. And while the Bill does not include a few of the new, limited exceptions introduced during the last DMCA Rulemaking, on balance it is still more permissive than most other regimes.